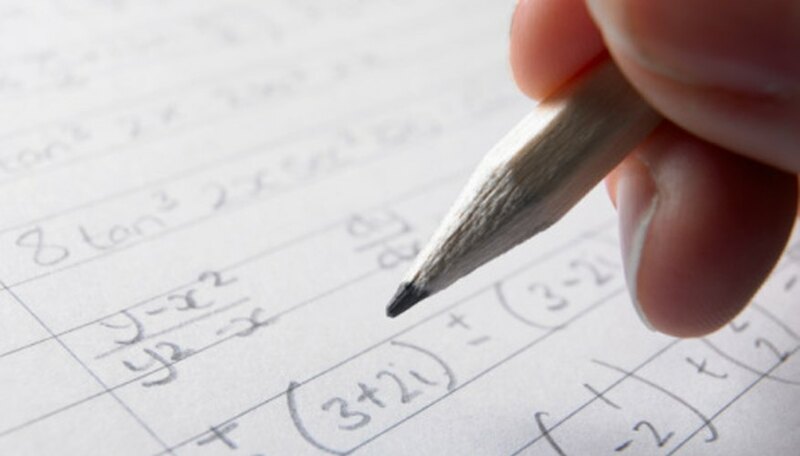 Solving a system of linear equations can be done by hand, but it is a task that is time-consuming and error-prone. The TI-84 graphing calculator is capable of the same task, if described as a matrix equation. You will set up this system of equations as a matrix A, multiplied by a vector of the unknowns, equated to a vector B of constants. Then the calculator can invert the matrix A and multiply A inverse and B to return the unknowns in the equations. Press the "2nd" button and then the "x^-1" (x inverse) button to open the "Matrix" dialog. Press the right arrow twice to highlight "Edit," press "Enter" and then select matrix A. Press "3," "Enter," "3" and "Enter" to make A a 3x3 matrix. Fill the first row with the coefficients of the first, second and third unknowns from the first equation. Fill the second row with the coefficients of the first, second and third unknowns from the second equation, and likewise for the last equation. For example, if your first equation is "2a + 3b - 5c = 1," enter "2," "3" and "-5" as the first row. Press "2nd" and then "Mode" to quit this dialog. Now create the B matrix by pressing "2nd" and "x^-1" (x inverse) to open the Matrix dialog as you did in Step 1. Enter the "Edit" dialog and select matrix "B," and enter "3" and "1" as the matrix dimensions. Put the constants from the first, second and third equations in the first, second and third rows. For example, if your first equation is "2a + 3b - 5c = 1," put "1" in the first row of this matrix. Press "2nd" and "Mode" to exit. Press "2nd" and "x^-1" (x inverse) to open the Matrix dialog. This time, do not select the "Edit" menu, but press "1" to select matrix A. Your screen should now read "[A]." Now press the "x^-1" (x inverse) button to invert the matrix A. Then press "2nd," "x^-1," and "2" to select matrix B. Your screen should now read "[A]^-1[B]." Press "Enter." The resulting matrix holds the values of the unknowns for your equations. Based in Denver, Dan Lecocq has been writing computer-related articles since 2011. He brings with him a wealth of expertise in graphics, general programming and mathematics. Lecocq received a Bachelor of Science in computer science from the Colorado School of Mines and a Master of Science in applied mathematics from King Abdullah University. Lecocq, Dan. "How to Solve 3-Variable Linear Equations on a TI-84." Sciencing, https://sciencing.com/solve-3variable-linear-equations-ti84-8205468.html. 24 April 2017.